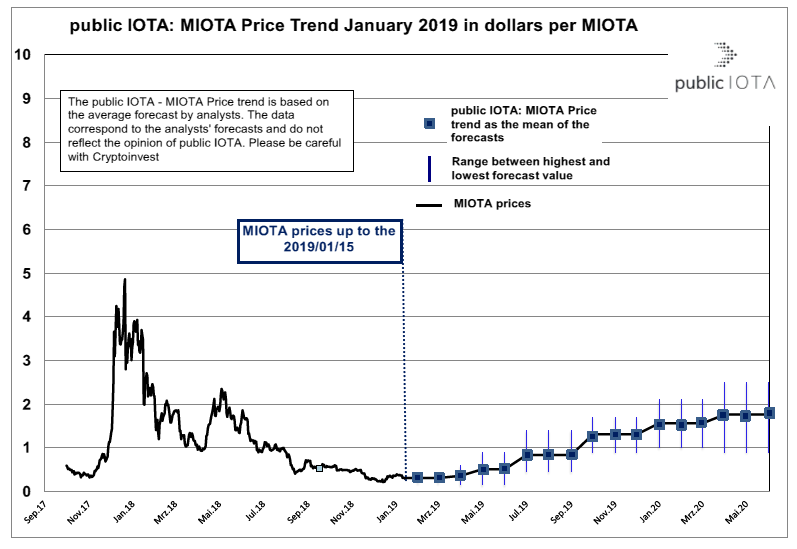 We have now released our MIOTA Price Trend of January. This price trend is based on the outlook of analysts who were asked about their mid-term assessment of the MIOTA price. So these data do not reflect our opinion, but are based exclusively on expert opinions. We will publish this trend monthly. Shown is the historical MIOTA price of one year. 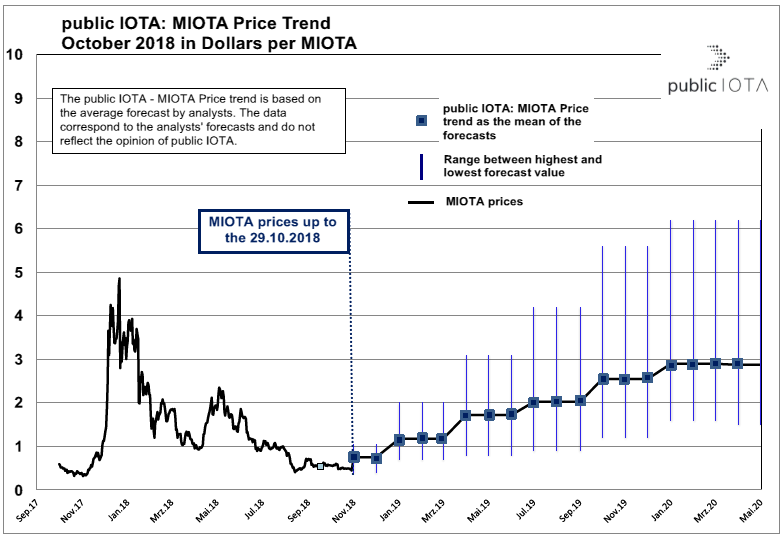 Furthermore, the analysts‘ price forecasts are presented as an average, as a so-called „public IOTA: MIOTA Price Trend“. In addition, the highest and lowest analysts‘ forecasts are reported. The experts are only partially in agreement on the short-term development. Some believe that things are going up steadily and others are seeing $ 0.15 . Whatever the short term, the experts see a medium-term uptrend. But the experts continue to be very cautious about the price development of IOTA. A slight increase in prices is expected over the next few months. This should not be a purchase or sale recommendation. Please keep in mind that cryptocurrency trading is highly speculative and involves a very high risk of loss!!! 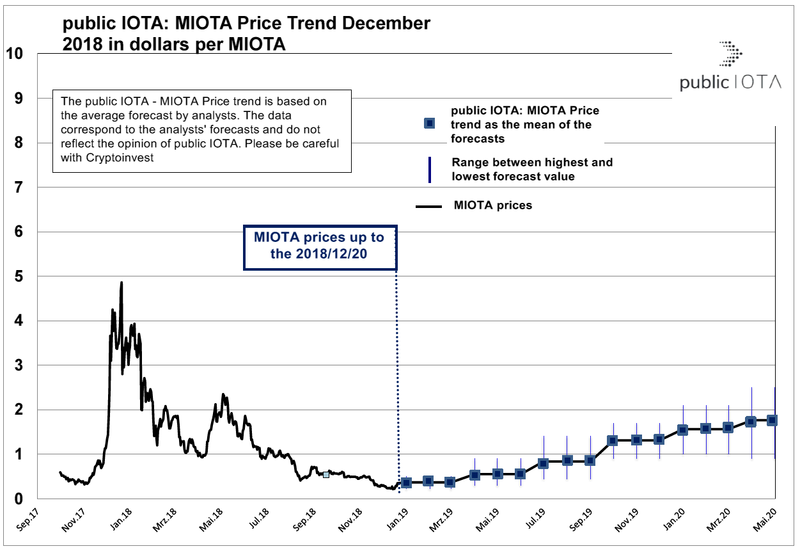 We have now released our MIOTA Price Trend of December. This price trend is based on the outlook of analysts who were asked about their mid-term assessment of the MIOTA price. So these data do not reflect our opinion, but are based exclusively on expert opinions. We will publish this trend monthly. 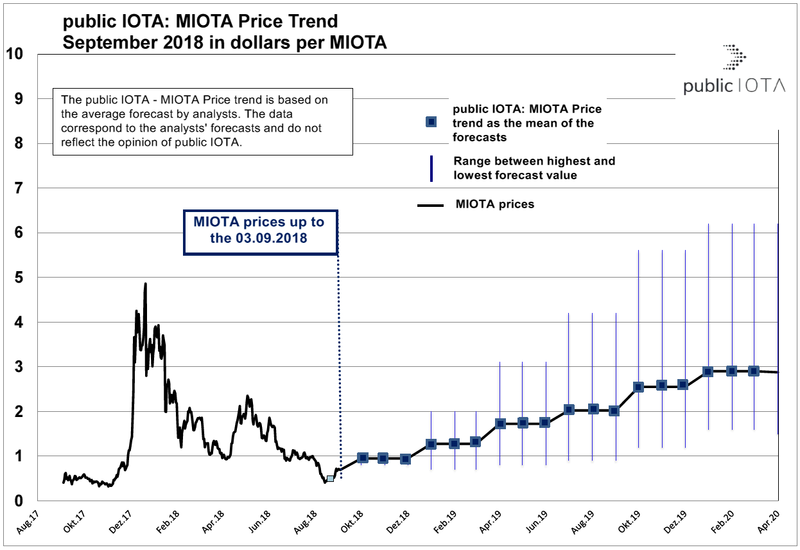 We have now released our MIOTA Price Trend of November. This price trend is based on the outlook of analysts who were asked about their mid-term assessment of the MIOTA price. So these data do not reflect our opinion, but are based exclusively on expert opinions. We will publish this trend monthly. In this MIOTA price trend, the experts become more cautious. The very large price increases that were forecast in the latest trends are now no longer predicted, at least for the coming months. The experts give as a reason for the rising price in the next few years, the slow decoupling of Bitcoin as a justification. There will be more and more exchanges in the next few months where you can buy IOTA directly through $ or €. Furthermore, the strong increase in the number of large cooperations is cited as justification for the increase. The price spreads are enormous. While the highest forecasts for 2020 are over $ 6, the lowest forecasts see the price at around $ 1.60. 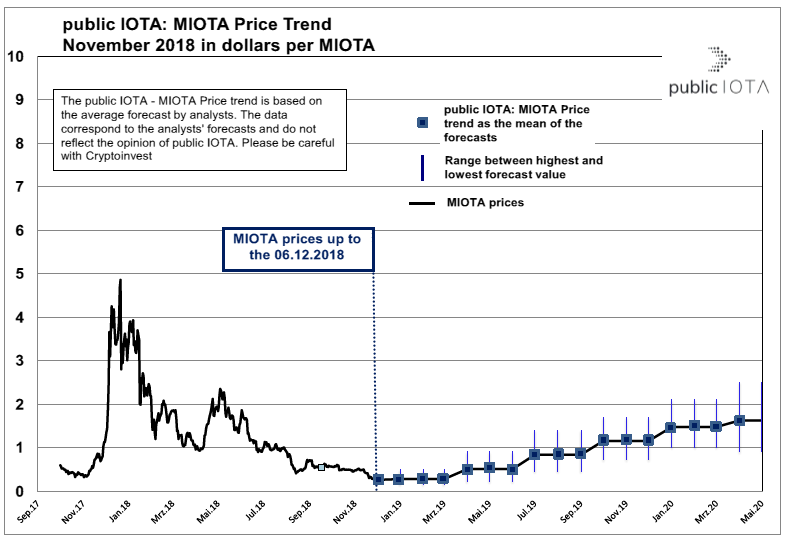 We have now released our first public IOTA: MIOTA Price Trend in September. This price trend is based on the outlook of analysts who were asked about their mid-term assessment of the MIOTA price. So these data do not reflect our opinion, but are based exclusively on expert opinions. We will publish this trend monthly in the future. In the next issue in October, we will introduce the individual analysts who participate in the trend in more detail. Stay tuned! For IOTA, the result is as follows: As of April 26, 2018, IOTA’s price was $1.82. By June 1, 2018, IOTA’s price per unit is expected to range from $2 to $2.30, according to our panelists. Daniel (Clayton Daniel; SPROUTSUPER.COM.AU) is the most optimistic about IOTA, predicting it to be worth $5.00 by the end of 2018. He says, “IOTA is the currency of exchange for the Internet of Things. With Power Ledger just recently signing a deal in Melbourne, I can see the real-life uses of this tech coming into play shortly. And as it does, someone is going to want to get paid. IOTA has positioned itself for this perfectly.” The following chart shows the price forecast. Thanks to finder.com for using this.